Here’s a long over-due children’s book review for a story that I first encountered on an audio recording at LibraVox, the website that records books in the public domain. Kenneth Grahame is best known for Wind in the Willows, and this children’s book has the same touch of brilliance. Everything is just on the edge of believable, even though it is surely make-believe. 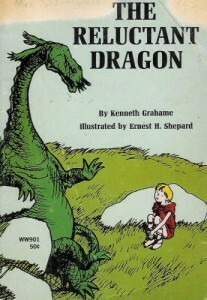 If the story of the Reluctant Dragon sounds familiar, it’s because it was turned into a Disney movie quite a while ago, and also has had several contemporary rewrites that fail to live up to the original. There’s nothing that can match classic children’s writing. This children’s book has all the quirky language that only serves to make the whole children’s book even more like an adventure. It’s a fabulous read-aloud for 5 and 6-year-olds, with ample places to stop and explain things. There are many versions of this book around, as it is out of copyright. However, I suggest looking for one that is completely unabridged, and perhaps with fewer pictures. There’s a version with illustrations by Ernest Shepard, who also did Winnie the Pooh. This is definitely a book that children can come back to again and again as their reading skills progress. Oh, and of course, the theme is the best of all- why fight when you can co-operate!